The layout is about my son's second birthday and how much he loved when everyone sang Happy Birthday to him and then how when he started to sing the song, he called it "Happy To You". 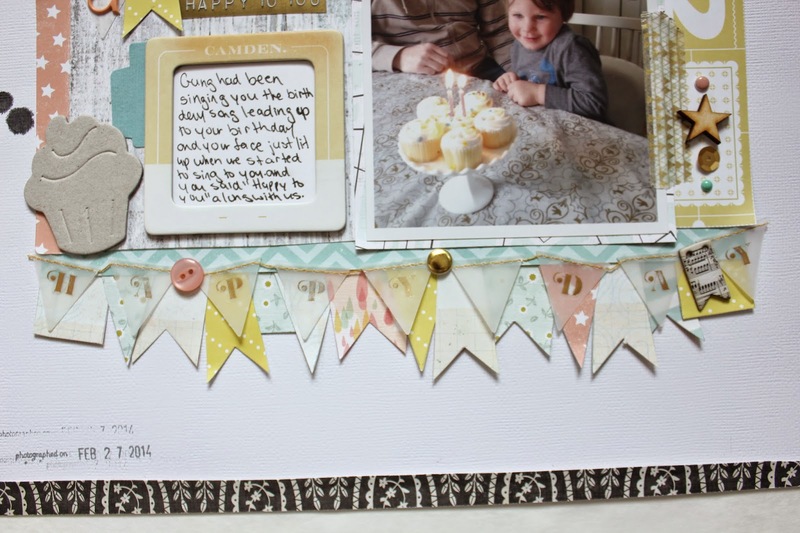 I made this layout almost entirely using Studio Calico's main Camelot kit. I added in the 'Happy Day' banner from Crate Paper, a chipboard frame, chipboard cupcake, and a few small embellishments and piece of washi tape from my stash. I really loved this kit, but since I only got the main and it came with the mask and ink dabber (which I love), I have had to supplement with embellishments from my stash usually when making layouts from this kit. I don't mind at all as there are few things that are as satisfying as using up your stash. Little bits all lined up again. That large veneer star came in an older Studio Calico kit and I just loved them. I've been using them sparingly. 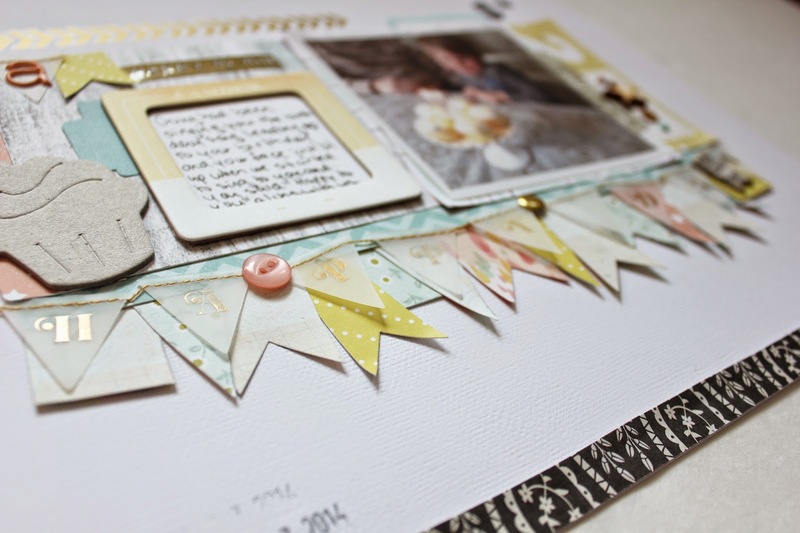 That gold triangle washi is one of my favourites. It came in a class kit at Studio Calico and I am going to be so sad when I'm all out. 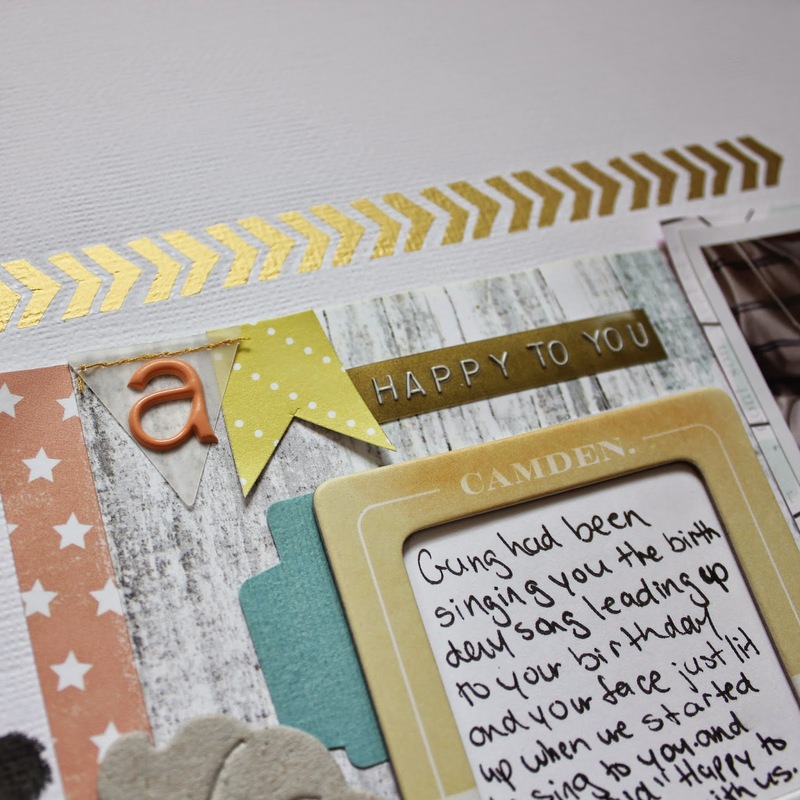 Gold washi just seems to go on everything. I love the way the layers of banners look across the page. The banner pieces of patterned paper I made from a pattern I cut based on banner pieces from Basic Grey. I love the variety sizes. I don't have a die cutting machine, so I cut them all out by hand. It was a bit of a process. I've said it before and I'll say it again, I'm sure banners are very 'out' now, but I love them and use them whenever I can. 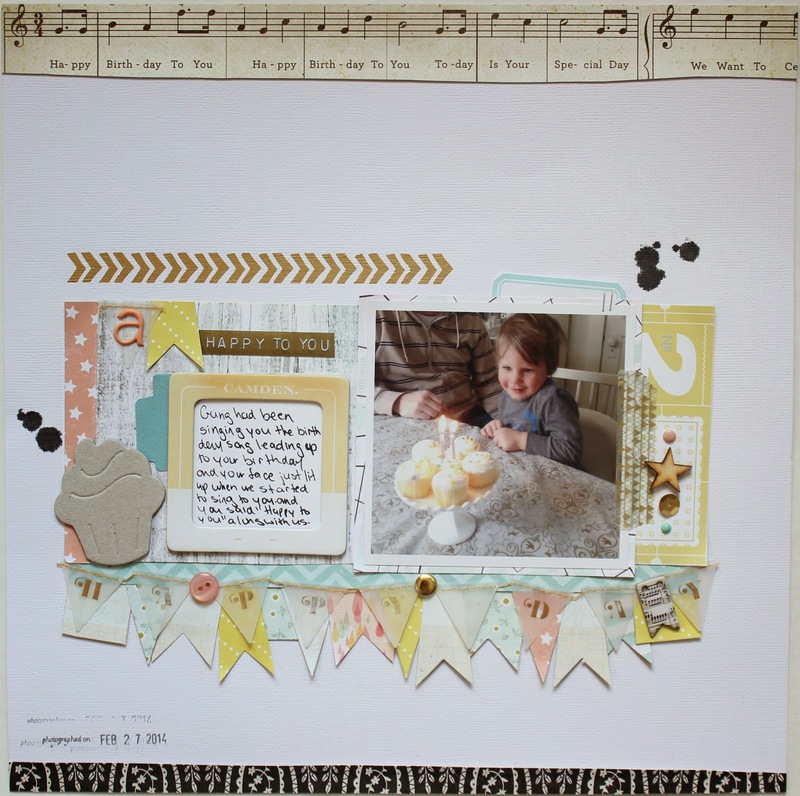 The Chipboard cupcake is from the October Afternoon Cakewalk Miscellany pack. I thought about altering it, but as there is so much going on on the page already, I liked the plain look if it. I used gold Dymo tape to make my title. I love my Dymo label maker so much because I never have to worry if I don't have enough vowels to make my title. As long as I have tape, I can put as many As or Es in my title as I want. My Dymo label maker is definitely one of my most used tools. It appears on most of my layouts and almost all of my Project Life spreads. I even have some neon tape and a cursive cartridge. Also, those Dear Lizzy gold rub ons, swoon! 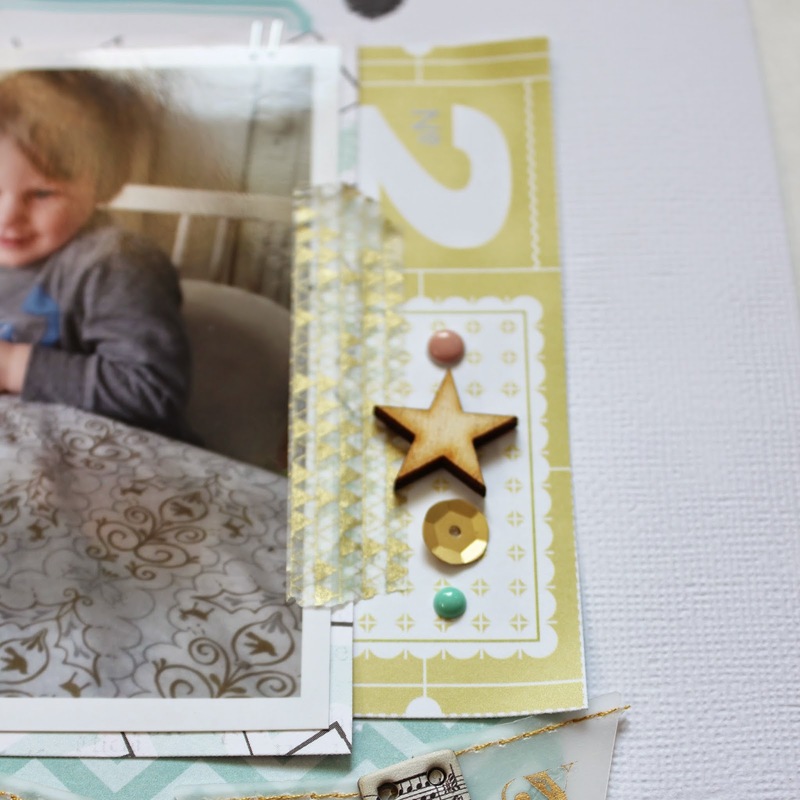 Is there a tool that you use while scrapbooking that maybe isn't a traditional scrapbooking tool that you just couldn't imagine scrapping without?